The title of the write-up might be a bit grandiose, but please bear with me. I have spent an incredible amount of time thinking about this topic. I have to admit I don’t make it a point to watch ToyBreak. For no other reason than it’s not on my radar. However George’s comments (starting at 11:20) got it thrust onto my radar – in fact, two separate message board threads brought the issue to my attention. The issue was George’s comments about art, custom figures, casting, and everything else he mentioned. His comments sparked a small firestorm – but it was fascinating to me, because the ideas of reproductions, bootlegs, counterfeits, kit-bashes, and art figures is something I have very specifically wrestled with on this website. I most recently wrestled with it at the beginning of the year. 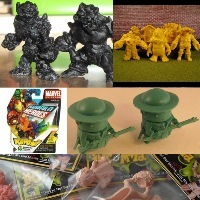 I have always seen art and mini-figures, specifically custom M.U.S.C.L.E. figures, as inherently connected and intertwined. I don’t believe it is fair to be cavalier when discussing custom figures; offhandedly declaring one art and another a bootleg. The easiest figures to declare as bootleg figures (as seen in Art 100) are poor quality mass-produced copies. I don’t think anyone would argue with that. As George said, simply remolding an old toy does not make you a great artist. I believe that he is correct in that assertion. There is simply no question that a person is illegally producing an unauthorized copy. It is fact. Making an exact copy may help an artist to grow because they are improving a technical component of their art, but it still doesn’t make them a great artist. If any person is unwilling to concede that fact, then a logical discussion cannot be had. However, illegally produced copies are not always a bad thing. I spent roughly 20 years trying to track-down an album from a local band. I went to every local record store, I scoured the internet, and once I thought I had found it as part of the Ann Arbor CD library (they had it at one time, but it had been stolen). Then on a fluke I found someone that had a copy of the album. They sent me the Zip file and in seconds I had music I hadn’t heard in 20 years. I would have paid the band for it. I wish I could have. But it was impossible. It also didn’t make the guy that sent it to me an artist. My point is that sometimes these illegal copies bring happiness to people. That doesn’t make it suddenly legal, but does it make it as ethically wrong? Of course the next point is, what about the original manufacturer?!?! They should be paying attention. If an individual re-casting figures is suddenly selling so many copies, then re-release originals – recapture that market. 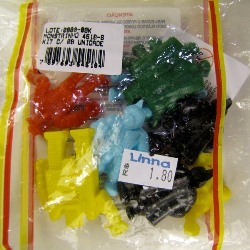 Of course, that scenario seems laughably unrealistic with many mini-figure brands. Furthermore, if someone is re-casting an ongoing line or an evergreen brand (Star Wars, Transformers, etc. ), then they are just asking for a cease and desist or worse. 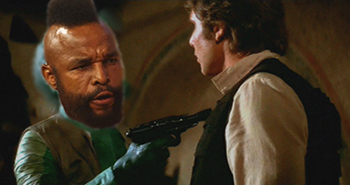 I pity the fool that doesn't pay Jabba! But I’m straying away from George’s original comments. He talked about how taking a Mr. T body and sticking on a Greedo head wasn’t art. Or that remolding old toys is not art. This is where I fundamentally disagree with George. Anytime someone works to create something new it can be viewed as art. However, not all art is good. And for me, that’s the important distinction. A few weeks ago I posted a video, Is Magic Art?. I thought it was a very insightful lens which could be adopted by fans of custom figures. George was wrong in declaring custom figures by Sucklord as art or “one-off’s” as art and other custom figures not art. He might like Sucklord and “one-off’s” better, but it doesn’t mean other customs aren’t art. It’s all art. Some people will see it as good, some will see it as bad, and some won’t even care. Art is subjective, and that is why I have found myself struggling with the tidal wave of new custom figures. I have attempted to be objective, and prided myself, on being objective – but I can’t really do either fully anymore when reviewing or spotlighting various custom figures. George’s comments certainly sparked a firestorm and he attempted to explain himself further on message boards. At one point he mentioned how taking the first and last paragraphs of a writer’s work doesn’t make you a writer. That’s true. But it could make you one hell of an artist. If you could take first and last paragraphs and make it work, make it interesting – illicit an emotional response; then you’d be looking at some pretty cool art. Really terrible - but still art! Lastly, I want to encourage any customizer, any sculptor, any hobbyist, anyone trying to make mini-figures or custom figures to share their work. It’s a constant evolution and even complete painful rejection can be a learning experience. I’ve encouraged people to make their own figures before and I will always continue to do it. I have seen the evolution of custom figures, specifically within the M.U.S.C.L.E. community, and I can tell you that we are in a golden age. But that’s because more people are trying. It might not all be great art, but it’s much better than no art. 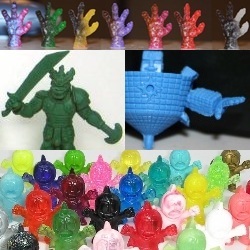 Be sure to check out just a small sample of, ever expanding, custom M.U.S.C.L.E. 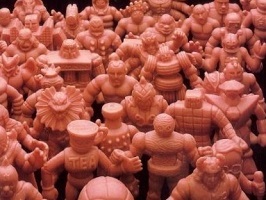 figures and M.U.S.C.L.E.-inspired figures in Art 200 and Art 300. This entry was posted on Wednesday, February 20th, 2013 and is filed under Art, UofM News. You can follow any responses to this entry through RSS 2.0. You can skip to the end and leave a response. Pinging is currently not allowed. Custom M.U.S.C.L.E. Figures - Puripuriman from Luke Harris | University of M.U.S.C.L.E.